The city relies heavily on input from its citizens. There are dozens of boards to choose from, but these are the most directly related to the city’s sustainability efforts. Members of the Sustainability Advisory Board host an informational table at the Annual Earth Day Fair. Volunteer citizen advisory groups are key partners in supporting the city’s sustainability progress. 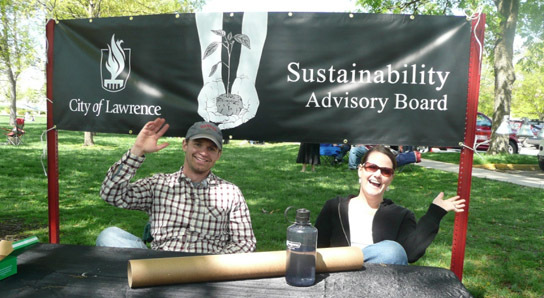 The mission of the SAB is to promote environmental protection, and advocate for policies which support sustainability (including environmental protection, waste reduction, recycling, energy conservation and natural resource conservation) in the City of Lawrence and to enhance the quality of life by enhancing the City’s efforts in these areas. The Mayor’s Task Force on Climate Protection was appointed in February, 2008, to create a Climate Protection Plan. The Climate Protection Plan was submitted to the City Commission in 2009, and outlines a greenhouse gas emissions reduction goal for the City. This group provides a communication linkage between the city and County Commissions and the community on bicycling related issues. This Board advises on all matters regarding on the City public transit system, such as proposed routes, service changes, ridership policies, fare structures, funding and budgets. The FPC will serve as a forum for discussion and coordination for community-wide efforts to improve the Douglas County community’s access to local food supply and distribution networks. The Solid Waste Task Force (SWTF) developed recommendations to the Lawrence City Commission regarding the long-term solid waste options for the citizens of Lawrence.